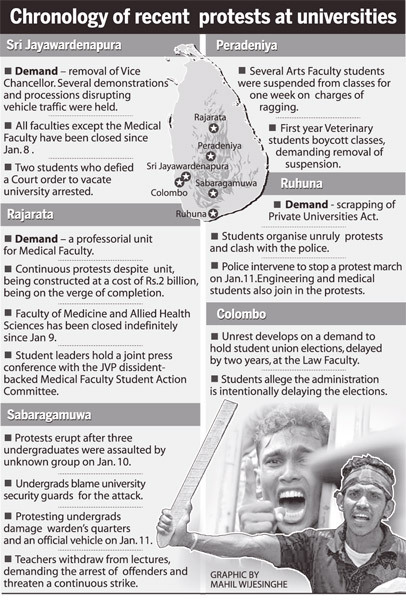 A suspicious bomb attack on a student monument within the Sri Jayawardenepura University premises triggered semi-violent protests across several universities. University grounds suddenly turned into battle fronts with students finding numerous reasons to clash with the administration. 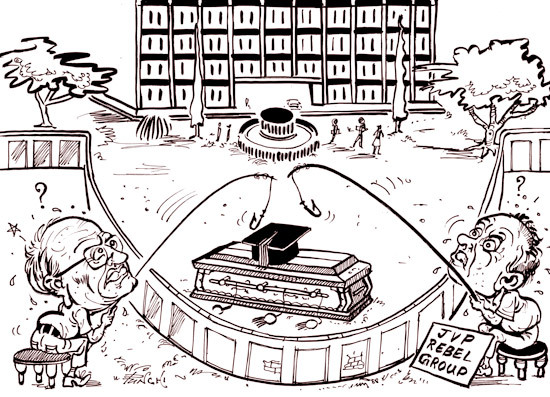 The Sunday Observer interviewed a number of stakeholders in the higher education sector to find answers as to what had triggered the sudden uprising among the undergraduates. When Rohana Wijeweera conducted indoctrination classes in universities, he told us the Vietcong (Vietnamese communists) shut the door on US imperialists’ infiltration into Asia. But via the Dudley – Sirima duo, the US once again started creating a window in Sri Lanka to creep in to Asia and revive their conspiracy. Over Rs.22,230 million have been invested in various development projects in the Anuradhapura district to mark the Deyata Kirula-2012 Development project, Telecommunication and Information Technology Minister Ranjith Siyambalapitiya said. With Sri Lanka aiming for a golden double of one million tourists and one million US dollars in revenue from tourism, and the country targeting nearly two billion US dollars in foreign direct investments and many developments taking place in Hambantota, a second airport was a crying need for almost a decade. Several new airlines too want to include Sri Lanka in their radar while the existing operators want to add capacity; hence, a second airport was a long-felt need.